This notice was posted outside each of the three apartments at 13 Lincoln St. in Granville. After remaining mum for several weeks, county officials visited the property Monday, posting a notice at the entrance of each of the three apartments. “This structure is unsafe and its occupancy has been prohibited by the code enforcement official. It shall be unlawful for any person to enter such structure,” the notice read. Securing the structure, making the required repairs and removing the hazardous conditions were exceptions to prohibited entrance. “It’s a good first step,” said Granville Mayor Brian LaRose. 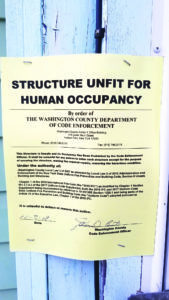 The posting, signed by Washington County Code Enforcement Administrator James Buxton, cited various regulations in which the property was found in violation, including some state and county fire prevention and building codes.